WASHINGTON - Sometimes a handshake can mean quite a lot. U.S. President Richard Nixon’s outstretched hand to Zhou Enlai in 1972 marked the end of a quarter-century of Chinese-American estrangement. 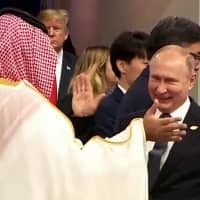 The decidedly bro-ey handshake between Russian President Vladimir Putin and Saudi Crown Prince Mohammed bin Salman at the Group of 20 summit last week was also laden with symbolism. 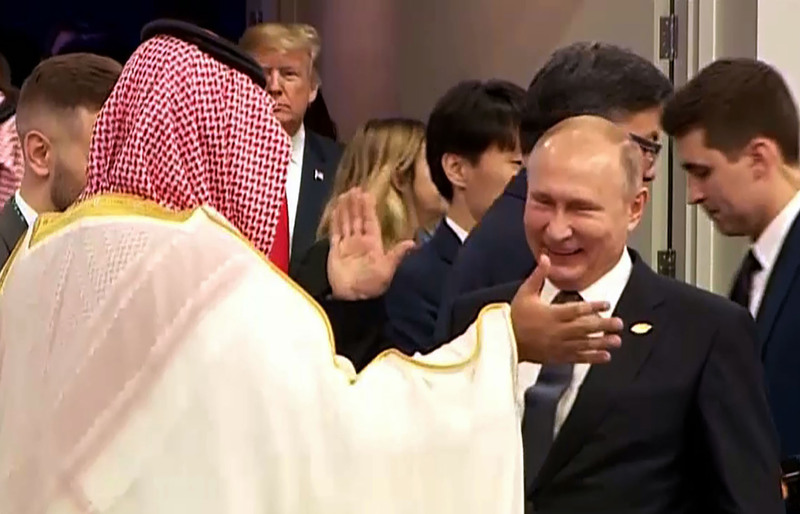 That handshake was, no doubt, a pointed reminder to Washington that the Saudis are willing to explore other geopolitical options if the U.S. gets tough in response to the assassination of the journalist Jamal Khashoggi. Yet it was also indicative of a broader trend that is reshaping global politics. Day by day, it becomes increasingly clear that a central fault line — perhaps the central fault line — in world affairs is the struggle between liberal and illiberal forms of government. And as this happens, geopolitical alignments are shifting in subtle but momentous ways. In particular, the bonds between the U.S. and many of its authoritarian allies are weakening, as those countries find that they have less in common ideologically with America than with its revisionist rivals. For decades, admittedly, the U.S. has worked closely with friendly dictators out of geopolitical necessity. During the Cold War, one could not easily contain the Soviet Union absent the cooperation of strategically placed autocrats in Turkey, Saudi Arabia, South Korea, the Philippines and many other countries. Yet the geopolitical glue in these relationships was always strengthened by a layer of ideological adhesive. Whatever their differences in how they managed their domestic politics, Washington and its authoritarian allies shared a basic ideological affinity rooted in intense anti-communism. The vast gulf between Soviet communism and right-wing authoritarianism, moreover, meant that there was usually very little chance of a friendly dictator switching sides in the Cold War. Argentina’s dictatorship may have flirted with the Soviet Union in the late 1970s, at a time when the Jimmy Carter administration was shining light on that junta’s human rights violations. But there was never any real likelihood that one of the most virulently anti-communist governments in the world was going to jump fully into bed with the leader of global communism. Today, the situation is not so simple. Anti-communism lost its valence when the Cold War ended, the Soviet Union collapsed and China went from being a communist autocracy to a capitalist autocracy. As a result, the ideological differences between America’s authoritarian allies and some of its chief rivals is no longer so stark. What Mohammed bin Salman, Egypt’s President Abdel-Fattah el-Sissi, Hungary’s Prime Minister Viktor Orban, Turkey’s President Recep Tayyip Erdogan and President Rodrigo Duterte of the Philippines have in common — other than being allies of the U.S. — is that they run political systems based on corruption, coercion and/or other autocratic approaches. They believe that open dissent and debate, protection of minority rights and restraints on government authority would weaken the illiberal polities they seek to construct and threaten their own personal power. In these respects, these “good” authoritarians are not so very different than “bad” authoritarians such as Putin and Chinese President Xi Jinping. At a minimum, they all fall on the same side of the debate over whether modern societies should be free and open or closed and controlled from the top. Given that there are few more important foreign policy issues than creating an environment in which one’s domestic system can flourish, and given that birds of a feather do often flock together, it is natural that this ideological convergence is having real geopolitical effects. In the Middle East, Russia is not simply building its partnership with America’s sworn enemy, Iran. It is also making inroads with U.S. partners Saudi Arabia, Egypt and even Jordan, based on those countries’ perception that Putin’s authoritarian regime can act decisively in support of its friends while avoiding American-style meddling in their domestic politics. Orban leads a country that belongs to NATO, but he has a chummy relationship with Putin and his government is generally perceived to be thoroughly compromised on matters concerning Russia. Turkey is also a member of NATO, but Erdogan has increasingly cultivated Russia as a partner and counterweight to the U.S., partially in response to exaggerated fears that America is allying itself with his regime’s domestic enemies. The Turkish government has even purchased advanced Russian S-400 anti-aircraft systems — and boasted about their ability to down American jets. In the Philippines, Duterte has sought to move his country closer to both China and Russia, not simply for geopolitical purposes but because of his sympathy for his fellow strongmen. As he put it in 2016, his goal was to position Manila in Beijing’s “ideological flow.” Finally, Saudi Arabia and other authoritarian U.S. allies have cooperated with Russian and Chinese efforts to water down international human rights norms in the United Nations and other forums. In more and more cases, authoritarian collaboration is crossing traditional geopolitical lines. It is important not to exaggerate this phenomenon; America’s partnerships with these countries are not about to collapse. Turkey will not cast its lot entirely with Russia, because it still needs the U.S. as a counterbalance to Moscow’s expansionism in the Black Sea. Saudi Arabia still depends heavily on the U.S. as a counterterrorism partner and check on Iranian influence. There are also some obvious exceptions to this trend. Vietnam thoroughly represses dissent but is drawing closer to the U.S. out of fear of China. Poland is a backsliding democracy but a solid partner in Eastern Europe. Yet, generally speaking, as the ideological distance between America and its authoritarian allies grows, and that between those allies and the revisionist powers narrows, there will be strategic consequences. Putin fully understands this: It is one of the reasons he funds illiberal politicians and partners throughout Europe. It is also one of the reasons Russia and China alike are working to strengthen authoritarianism and weaken democracy in countries around the world. So how should the U.S. respond? One strategy would be to purge considerations of ideology from U.S. foreign policy. Washington could stop speaking out about human rights abuses by friendly dictators; it could define its relationships accordingly solely to balance-of-power logic. This appears to be President Donald Trump’s basic approach to geopolitics. Yet although this approach would likely ease ongoing tensions with Saudi Arabia, Turkey and their ilk, it would also compound the global pressures on democracy and undercut the idea that U.S. policy stands for more than simple realpolitik. A second approach would be to embrace the ideological challenge. The U.S. could double down on its relationships with liberal democracies, repairing core alliances that Trump has damaged and cultivating closer ties with democratic powers from Colombia to India to Indonesia. It might redouble investments in protecting democracy where it is endangered and promoting it — in countries such as Malaysia — where processes of liberalization are underway. It might push its authoritarian allies to be modestly more respectful of human rights and political liberties, using levers such as restricting arms sales or discontinuing military exercises. At the very least, it would make clear that its relationships with those allies are more transactional and less special than those with its fellow democracies. In the near-term, this latter approach might further roil troubled waters in America’s dealings with some of its autocratic friends. But it would have the considerable benefit of recognizing that, in an age when liberalism and illiberalism are increasingly in conflict, the U.S. will be hard-pressed to defend its interests without also defending its ideals. Hal Brands, a Bloomberg Opinion columnist, is the Henry Kissinger distinguished professor at Johns Hopkins University.